KishaRose: It's all about the DEETS! It's all about the DEETS! It's the weekend baby! Happy Friday loves i'm super excited on this day. I have a long weekend with people to see and places to be. Ha! I wanted to share a little vintage love with you guys before the festivities begin. This blazer um this blazer... What striked me about this blazer was the beautiful buttons and how they were placed. Detail is everything and I was sold at first site. 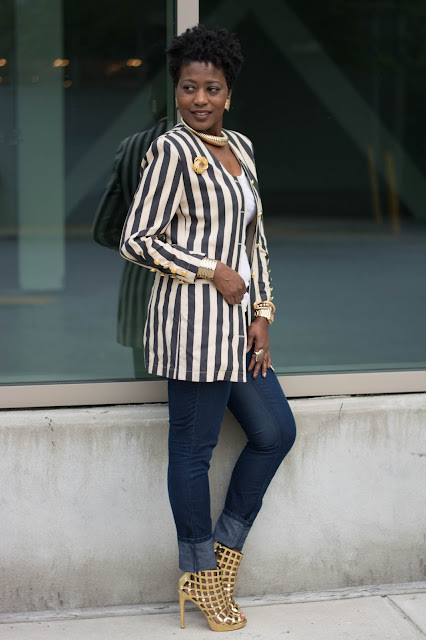 If you follow my blog I have been heavy into denim and this stripe number continues to tell that story. Although winter is approaching I still have big plans for this blazer. Will you guess where I scored this lovely from? If you guessed I treasured it welp you are correct! If I had left it in the store it would have HAUNTED me that I didn't get this cutie. Let's all say SCORE! Take a look at how I styled this ensemble. Pairing dark denim skinnies the same as the stripe worked for me. Sealing the deal with metallic accessories and booties savored the moment. Let's talk about Katita from Shoedazzle! This bootie is yummy! The cutouts brings this baby to LYFE! Exactly a stellar finish for the major detailing of the blazer. Details are important when you speak fashion and i'm in awe at how many have their views and put their spin on the specifics of a look. Ooooo and I like it! 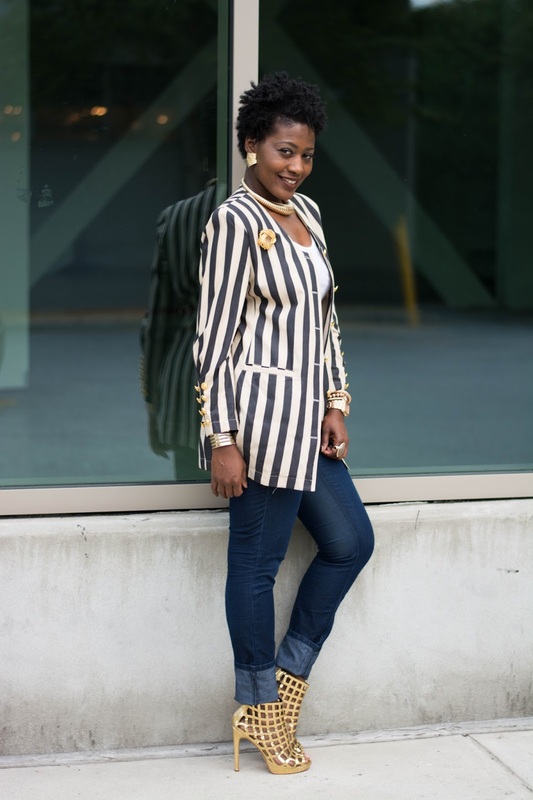 What's your take on the particulars when styling your look? Drop a line. I'll be waiting! Until then... Shop Smart. Look FabuLess! Thanks love! Thanks for stopping by! This look is fabulous!!!! 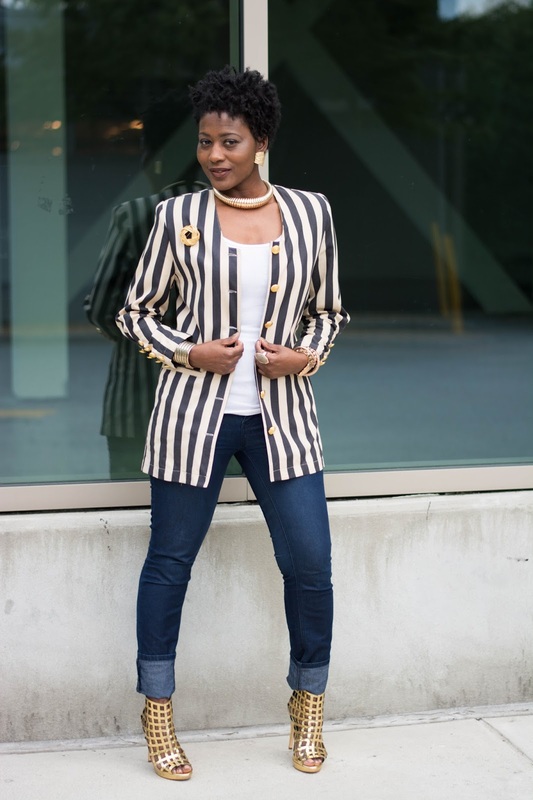 Loved how you paired this blazer with jeans! !